Who knows why any one stops any time, anywhere? Why this trough, which is probably a truck tire track, filled with rain water in a gravel-bedded parking area. But there it is, the puzzle that all photographers deal with all the time. Something catches the eye, with no rational reason for it. Maybe it was the color of the light as the day waned, which, when seen against the new green of the hills at that hour set off the slightly warmer feel of the gravel, or perhaps it was the piece of sky that made its poem in the trough, falling to earth in a way that made me pause. These are the mysteries of this remarkable medium that so many of us are in dialogue with, and that makes it is so compelling. 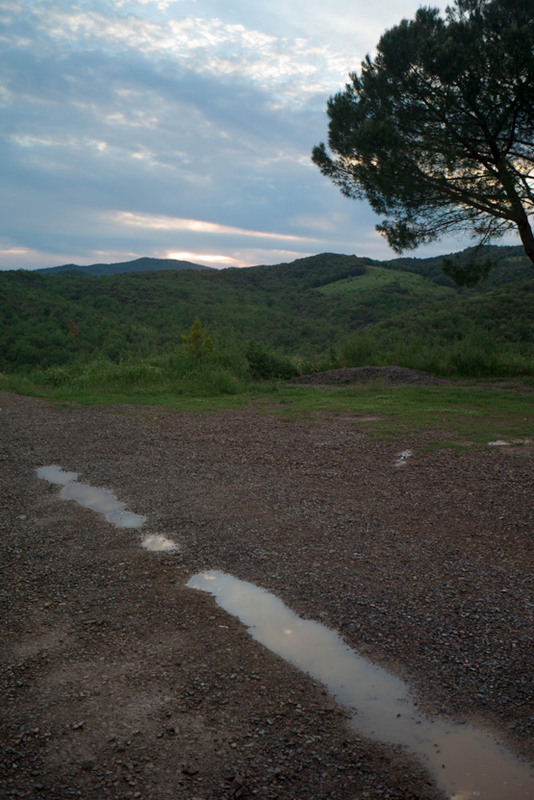 This entry was posted in Evening light, Springtime, Tuscany and tagged Dusk, Landscape, Light, Trees, Tuscany, Water on May 7, 2015 by joelmeyerowitz2014. I like this one a lot, simple and quiet, the edge of our changing of the landscape, with some other edges further out in the cleared areas of forest. Parallels between the wheel rut and the angles of the valleys in the forest too. A gravel pile like a smaller facsimile of the hills.